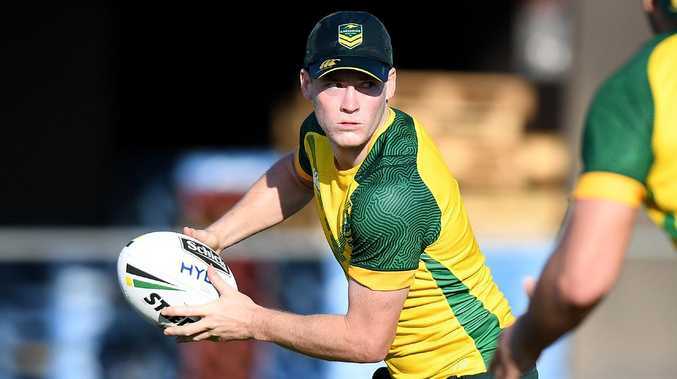 Luke Keary has been cleared to take his place in the Kangaroos side. AUSTRALIAN skipper Boyd Cordner has confirmed that Luke Keary will take on Tonga, after overcoming concussion issues. Keary went off in the 17th minute in his debut against the Kiwis, after he got his head in the wrong place, but he will be a definite starter against Tonga. "He trained well today and he will be ready to go," Cordner confirmed on Friday. "We limited his load and what he could do with contact this week, but he has been really good. "He's been in good spirits and he's fine and he wants to go out and play well for Australia." The Kangaroos' struggled against New Zealand and they clearly missed Keary's running game and game management. In his absence halfback Daly Cherry-Evans and replacement Ben Hunt struggled to direct the team around the park and Cordner is excited to see what Keary can do in his second Test outing. "He's an unreal player and he's proven that all year" Cordner said. Coach Mal Meninga talks tactics with playmaker Luke Keary. "Any game when you lose your half it really hurts, especially early on, but he's a dynamic player and he's been picked in this Australian team for a reason and I think he showed that in his short time that he was on the field against New Zealand. "We are very glad to have him back." However Keary can't work his magic unless the Kangaroos' forwards set the platform upfront. Only David Klemmer ran for over 100 metres against the Kiwis and the Kangaroos face an excellent Tongan pack featuring Andrew Fifita, Jason Taumalolo and Tevita Pangai Jr.
Cordner knows his forwards will need to improve on their first outing to match it with the Tongan giants. "They have a really powerful pack," Cordner admitted. "If you look at their starting pack, they are big boys and they are hard to tackle and they've got good motors as well. "There is no secret we are going to have to control their offence through the middle and defend really well to stop their momentum."